About 10:50 pm on May 15, 2000, two friends, Pete and Lui, were on the rooftop patio of Pete's condominium building in North Vancouver. Although viewing conditions weren't great (a full moon and a lot of light pollution), they were taking advantage of their schedules, and the clear weather, to do a little skywatching. Lui was scanning the skies with his new wide-angle binoculars while Pete was making adjustments to his telescope. Pete heard Lui call his name a couple of times, but he didn't look up until he heard Lui say, "What the Hell is that?". Luckily, Pete was kneeling beside his telescope, about 10 feet south of Lui so that when he looked up he was at the right angle to see the object. They both saw a large boomerang-shaped craft in the northern sky, travelling west. It was big, silent and moving fast. 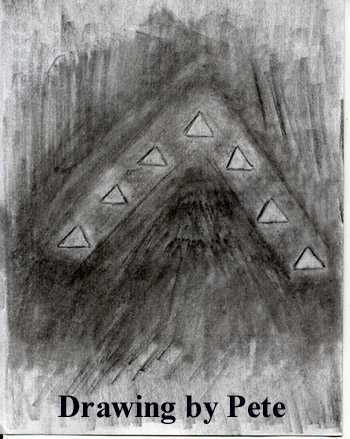 Pete said that the first things that caught his eye were the seven wide triangles - one in the center and 3 down each side (see drawings). The triangles were dim, not illuminated, and the rest of the craft was "transparent black". When Pete first saw the object it was due north, about 45 degrees above the horizon, and was only in view about 5 seconds before it disappeared behind the roof of the condominium. Lui had originally seen it further to the east, but estimates he viewed it for less than 10 seconds. They agree that it was about 1000 feet above the ground and width of 3 fingers held at arm's length. A rough calculation based on all of the information would put the object in the range of 140 feet long (approximately the same width also). UFO researcher Martin Jasek, of Whitehorse, cautions us with this: "A word about guessing distances. Human binocular vision ends at about 30 feet. 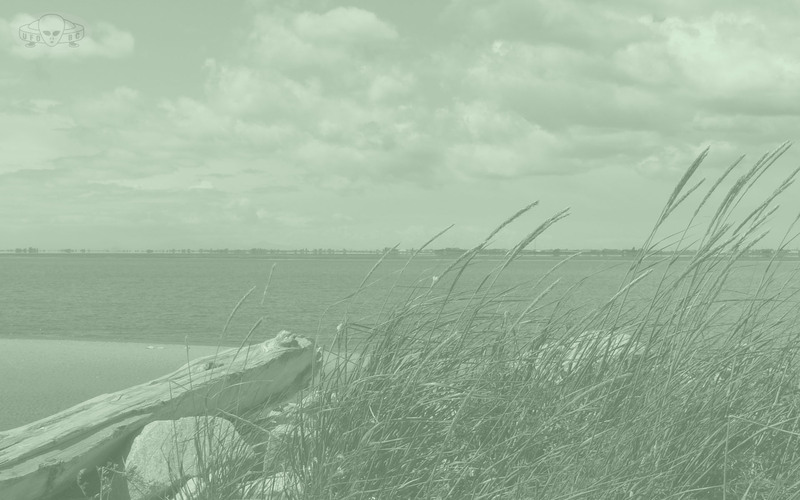 One may be able to estimate distance substantially beyond this limit if one is looking at a familiar object such as a person, car, Cessna or 747. Unfortunately, UFOs aren't usually familiar objects." Both Pete and Lui are married with children, work as Automotive Technicians and share an interest in Physics, Astronomy and the topic of UFOs. 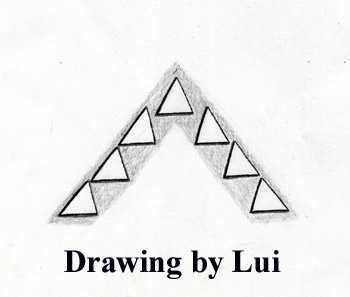 Although Lui provided an excellent drawing, he was reluctant to meet with us to discuss the sighting. What he saw that night has left him with an unsettled feeling and the "heebie-jeebies".